This Segment Top Country French Exterior Wood Entry was custom designed and built by Doors By Decora to change the look of this Montgomery home. (see the “before” picture below) It was built out of Knotty Alder. 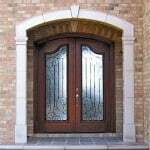 It consists of a pair of 32″ x 96″ M-2-E Doors with a 20″ Rabbited Transom above it. The Rocky Mountain Hardware compliments the Antique Ceramic Door Knockers which were provided by the Customer.